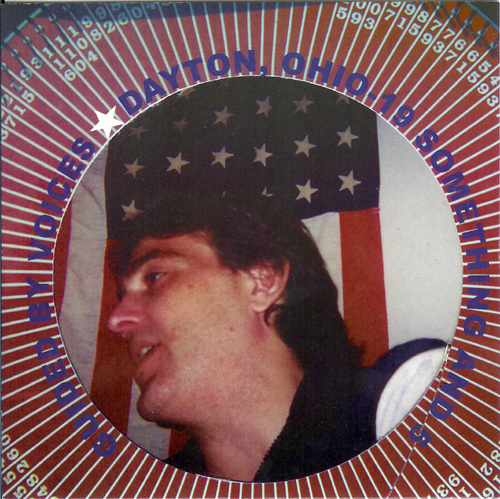 Number 5 in the Fading Captain Series, this 7'' contains a live version of "Dayton Ohio-19 Something and 5," a song originally featured on the GBV LP Tonics & Twisted Chasers. The live version was recorded at The 40 Watt in Athens, GA in 2000. The b-side contains 4 Pollard, sad sack acoustic numbers. Why is this a release? No real reason. Dayton Ohio 19- Something and 5 [LIVE]- 5 As mentioned in the intro, this is a live version of what was originally released on the Tonics & Twisted Chasers LP. Main riff is slightly altered, but remains an amazingly lackadaisical song with hazy but killer hooks. Fairly well recorded live track complete with rough vocals. Possibly the better of the two, but twice as long. Put it on a mixtape. Travels- 2 Sad, somber track, constructed of mostly lush acoustic plucks. However, too flat out flat, practically falling on deaf ears. Nothing really sticks here. No Welcome Wagons- 2 Repetitively plucked minor chord with cryptic lyrics. Depressing in the wrong kind of and dried up kind of song. Selective Services- 2 Sparse acoustic strums. Cold and hollow. Stream of conscience lyrics spewed on top. Distant and sad, but not really worth a memory cell. listening to this for the first time in a long while. side B makes for a good accompaniment for a depressingly overcast morning interrupting what so far has been a spectacular summer.